Expresar con armonía los mensajes, es lo mejor. Los diseños son una forma de expresar mi percepción de la realidad y a la vez lograr la satisfacción del cliente. "Great design and excellent response time. Fully recommended!" "i loved that the card is simple yet eye catching." "great design ideas and great communication"
"The very best. This person is a true professional!!! Very creative. Very responsive. I would like to continue with this designer on other projects. Thank You"
"Very pleased with the design process for my business cards and letterhead. 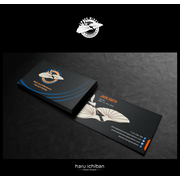 Haru Ichiban was quick to make requested adjustments and came up with great ideas and images that were far better than what I had seen. Top marks."